To spend a night with a hostel’ pub crawl is almost an essential activity for every backpacker. Alone or with friends, the cheapest and sometimes the best type of accommodation is a hostel. It is a great way to meet new people who also travel and you can make a lot of new friends for life! Some hostels offer extra activities like tours or Pub Crawls. Again, those are a great opportunity for you to meet people from all around the world. When you visit Paris as a backpacker, it is safe to assume you travel on a budget. With that consideration in mind, the best places to stay are usually hostels. Hostels are little melting pots for people from all around the world that usually share at least one common trait. That is love for traveling and exploring the World! Since hostels are usually places that almost expect you to socialize with others, it is a great place for you to find new friends for life! The best part is that hostels are, most of the time, the cheapest option for accommodation. What more could you ask for? They’re not expensive and amazing opportunity for great new experiences! Some of the best hostels you could go to, to enjoy the best activities include Les Piaules, Plug-Inn, Smart Place, or Trendy Hostel. Find more hostels on our Partners page. Most of the hostels care to create almost personal relationship between the staff and customers or between the customers themselves. That usually helps with the strange feeling one might have traveling alone or visiting the city for the first time. Not all hostels are good at actually establishing such a good relationship with its customers, but everyone at least tries! A good way hostel can achieve this, is by providing different activities guests can participate in. Walking tours, trips, and culinary tours and of course, pub crawls! If you are wondering “What is a pub crawl?” wonder no more. Pub crawls are basically night tours that take you from one bar to the other for a reasonably low price. They usually also offer different discounts on drinks, happy hours or free entries to the establishments you visit. You end up saving money for paying just a few euros for the ticket and saving a lot of money on entry fees to clubs and such. Who doesn’t like a good deal! Sometimes, hostels offer pub crawls they organize themselves, other times they have an intermediate, like Riviera Bar Crawl & Tours. These companies specialize in creating the best experiences for tourists and locals. 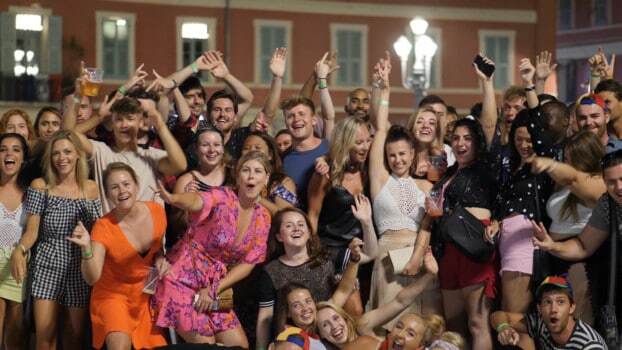 Riviera Bar Crawl & Tours is a company based in Nice, France that has years of experiences providing the best bar and pub crawls on French Riviera. Recently, they also expanded their successful business to Paris, as they felt there was no pub crawl that could offer the services, in the same quality, Riviera Bar Crawl & Tours does. And so, they opened Pub Crawl Paris during the start of 2019. Riviera bar Crawl Paris cooperates with several hostels in Paris and offers to visit 4 venues in the Latin Quarter. Latin Quarter is known to be the heart of Paris, with its vibrant nightlife and many bars and clubs you can visit. The pub crawl connects locals and tourists from all around the world, in bars that are visited by proper Parisians. With the Pub Crawl, you will visit 3 Bars and 1 Club that are “off the beaten path”. Like so, you can party like a Parisian and avoid the “Tourist Traps”. For only 15€ you will get free admissions to all the venues, drink specials and discounts and 3-4 shots for free! Not a bad, if you ask me. Remember, that if you decide to go on your own, you risk visiting boring bars or even bars you might not be welcomed in. Another thing you need to pay attention to is that bars and clubs have entry fees and pretty expensive drinks. You also lower your chance of meeting new people who love to travel. Altogether, you might end up not enjoying your night and spending a lot of money for that. And who would want that – we definitely wouldn’t.